Bringing the idea of hitchhiking up to date, Comuto is a startup that lets users offer seats in teier cars for a price whenever they make a planned journey. It’s essentially ‘AirBnB for car journeys’, and according to new figures from the company, it’s growing fast. 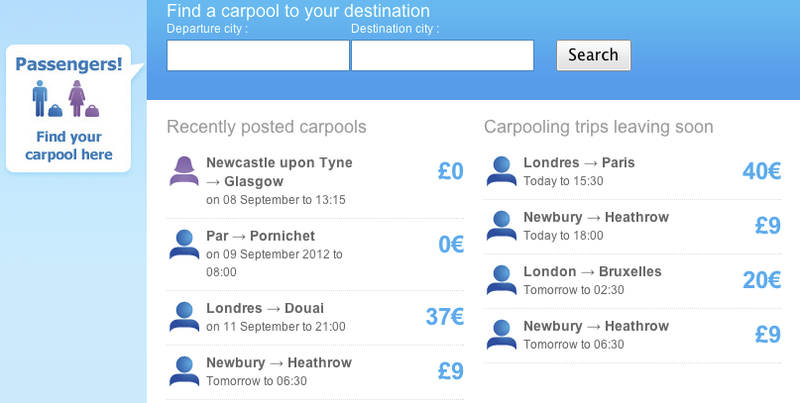 Launched in France in 2006 as Covoiturage (French for ‘carpooling’), the company has since expanded into Spain under the Comuto brand, and it hit the UK earlier this year as BlablaCar. Co-founder Nicolas Brusson explains that although other carpooling sites have tried similar concepts, they tended to focus on commuting, with a Craigslist-style classified ads approach. Comuto spotted an opportunity to capitalize on the many long distance car journeys that take place with empty seats, allowing users to book places on journeys as they would via the likes of Expedia, except for private car journeys instead of public transport. After slow growth in the first couple of years, Brusson says that the service is picking up pace with 1.3 million users across its three territories, increasing by around 100,000 per month, with half a million new journeys created by drivers monthly. In all, users of the service have shared one billion kilometers of journeys. While that first billion took five years, Brusson says that growth is such that the next billion should only take one year. The plan for the future is to expand into further European territories, with Italy being a likely target. Brusson says that despite only being active in the UK, France and Spain, plenty of cross-border travel takes place into other countries anyway, with people in Belgium, Switzerland and Portugal all making use of the service. Although the service currently has different names for its three regional sites, they all share the same backend, so users in the UK can search for journeys in Spain, for example. The plan is to consolidate under the BlablaCar brand in the future. Interestingly, Brusson believes that we may not see a successful example of this kind of service in the USA. “Owning a car in the US is much less painful than in Europe,” he says, pointing out the lower cost of fuel and other overheads on the western side of the pond. Maybe Europeans are just a little more social and don’t mind sharing their cars with strangers in return for a fee. Whatever the reason, it seems that Comuto and the BlablaCar brand is a startup to look out for as it expands though Europe.